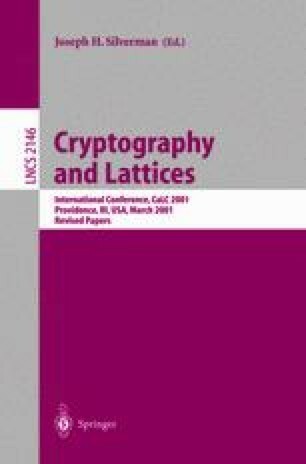 We describe a simple technique that can be used to substantially reduce the key and ciphertext size of various lattice based cryptosystems and trapdoor functions of the kind proposed by Goldreich, Goldwasser and Halevi (GGH). The improvement is significant both from the theoretical and practical point of view, reducing the size of both key and ciphertext by a factor n equal to the dimension of the lattice (i.e., several hundreds for typical values of the security parameter.) The efficiency improvement is obtained without decreasing the security of the functions: we formally prove that the new functions are at least as secure as the original ones, and possibly even better as the adversary gets less information in a strong information theoretical sense. The increased efficiency of the new cryptosystems allows the use of bigger values for the security parameter, making the functions secure against the best cryptanalytic attacks, while keeping the size of the key even below the smallest key size for which lattice cryptosystems were ever conjectured to be hard to break. Research supported in part by NSF Career Award CCR-0093029. O. Goldreich, S. Goldwasser, and S. Halevi. The GGH cryptosystem, challenge page. http://theory.lcs.mit.edu/~cis/lattice/challenge.html. V. Shoup. NTL: A library for doing number theory. Available on-line at URL http://www.shoup.net/ntl/index.html. P. van Emde Boas. Another NP-complete problem and the complexity of computing short vectors in a lattice. Technical Report 81-04, Mathematische Instituut, Universiry of Amsterdam, 1981. Available on-line at URL http://turing.wins.uva.nl/~peter/.